One day, Seruni went to the field alone, because his parents went to a neighboring village. Seruni was only accompanied by her beloved dog named Toki's. Arriving at the farm, she didn’t work but he just sat there looking at the natural beauty of Lake Toba as if she had solved a difficult problem. While the dog, the Toki, came sitting next to her, staring at her face as if he knew what Seruni thought. Once in a while the dog barked to distract Seruni, but she is not teased. "Yes, Lord! I am not able to live with this burden, "complained the Seruni. A few moments later, Seruni moved from his seat. With tears, she walked slowly toward the Lake Toba. Apparently she wanted to end his life by jumping into the lake's and the Toki, followed his master from behind while barking. "Help.. Help.. Help.., Toki! "Seruni voice asking for help to her beloved dog. "Ah, I'd rather die than live a long time to suffer," Seruni resigned. Arriving at the master's house, he immediately went to Seruni parents. "Auggg ...! auggg ...! auggg ... "Toki's barking while clawing at the ground to tell the parents that the Seruni in danger. "Toki ..., where is Seruni? What happened to her? "Asked the father to the dog's Seruni. "Auggg ...! auggg ...! auggg ...! "he continued barking and ran back and forth to invite them to a place. "Sir, it looks like Seruni in danger," said the mother of Seruni. "Mom was right. The Toki invites us to follow, "said the father of Seruni. "But how do we get there? "Said the mother. "You prepare a torch! I'll be looking for help to neighbors, "cried the father. Soon, the whole neighborhood had gathered at the home page Seruni's father, carrying the torch. After that they followed the Toki to the scene. Once they were in the field, the Toki directly toward the mouth of the hole. Both parents of Seruni immediately approached the mouth of the hole. What a surprise when they saw a hole big enough rock on the edge of their field. In the pit was heard the faint sound of a woman: "Parapat ...! Parapat Parapat stone ...! " "Sir, listen to that voice! That voice is of our child! Seruni’s mother cried frantically. "Yes, ma'am! That sounds Seruni! "Replied the father panic. "But, why would he shout: Parapat, parapatlah stone?" Asked the mother. "I do not know, mom! It seems like there's something wrong in there, "said the father anxiously. "Seruniii ...! Seruniii ...! "Cried the father of Seruni. "Seruni ... my daughter! The mother and father came to help you! "Her mother shouted. "Parapat ...! Parapatlah stone ...! Parapat! " "Seruniiii ... my daughter!" Once again the mother screaming and crying hysterically Seruni. People in attendance at the place were trying to help. One held ropes to the bottom of the hole, but the slap was not touched at all. Seruni's father increasingly concerned with the state of her father. He also decided to follow her foray into the rock pit. "Mom, hold the torch!" Command of the father. "Where do you want to go?" Asked the mother. "I'm following the Seruni into the hole," he replied firmly. "No dad, it's dangerous!" Prevent the mother. A moment later, suddenly heard a roar. The earth shook violently as if to an end. Rock hole suddenly closes itself. 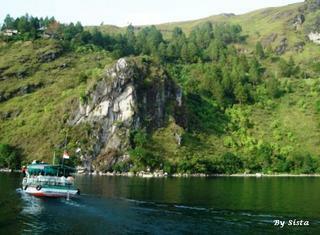 The cliffs at the edge of Lake Toba was falling. Seruni's father and mother and all the people ran thither to escape. They left the mouth of the hole the rock, so that poor Seruni could not be rescued from the crush of rock. A few days later, fame spread the word about the events that befall her. The people flocked to the scene to see the "Hanging Rock" is. Residents who witnessed the incident told other people that before the hole was closed, a voice: "... Parapat Parapat parapat stone ...!"